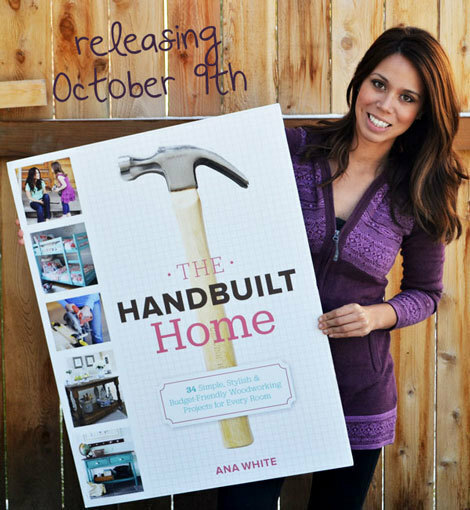 Thanks to a blog post I read in November of 2012, I was introduced to a new book that had just come out, called The Handbuilt Home, by Ana White. It was purported to be a book that gave easy, comprehensive instructions to make furniture, no matter your experience level. On a whim I put the book on my Christmas list, and on the plane ride from Florida, where we spent the holidays with my family, back to Los Angeles where me and my partner had just moved, I read the book cover to cover and was penning a list of all the things we needed to buy at Home Depot on a drink napkin. Since putting all our stuff in storage in New York and spending 4 years in furnished rentals in Vancouver, we had no furniture to speak of, and more than anything, we needed a table and some places to sit; our first days in our LA rental found us in one primary spot in the house: a mattress in the middle of the living room floor, where we slept, ate, watched tv, read and cuddled. It took hardly any time at all for the coziness factor to wear off. Anyways, my logic was this: we could either spend over a thousand dollars on a finished beautiful dining room table, or we could spend half that money on tools and materials and build one ourselves. Then, if we found the process to be fun and worthwhile, we could KEEP building furniture, making the investment of tools more cost effective with each project. Unfortunately, after our first two projects (a Farmhouse style dining room table and a matching bench), Claire’s interest had waned, but mine grew, and over the past year and some change I have continued to build furniture by myself, becoming more competent and taking on more challenging tasks. So far we have built the aforementioned dining room table and bench together, and I have worked solo on a coffee table, bookcase, printer console, upholstered vanity stool, and a rolling kitchen island, along with a slew of other smaller woodworking projects. 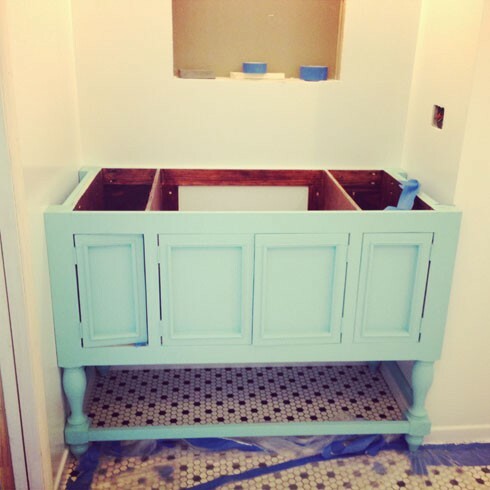 I wanted to share my latest furniture DIY creation here on my blog, because it is my most ambitious project to date. We recently got a master bathroom renovation to turn our tiny, barely functional hallway bath into an en suite with much more space and efficiency. In trying to make the most of our budget, I decided to take on the task of building our vanity, which, if purchased in the style and materials we wanted, would run us no less than $1500. 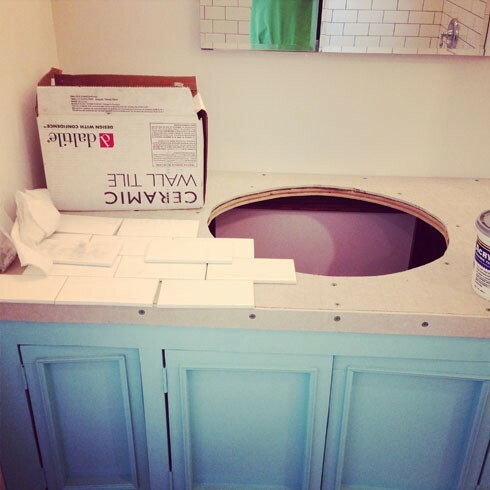 With some free plans from Ana White’s website and a bit of advice from our contractor, I built the tile topped vanity from scratch and tiled the surrounding backsplash for $490, and it was custom built to fit the exact measurements inside our new bathroom. The project took about 11 days from start to finish, and the most difficult part of the whole project was the tiling. I had never tiled before and it was WAY more intense than I anticipated- I sprouted stress-induced fever blisters within hours after all the grouting was complete. I don’t think you can put a price on fever blisters, but all in all, the project came out beautifully and I am very very proud of it! I built the wood part of the vanity in my garage and when it was ready for the next steps, our reno crew moved it to the inside of the bathroom. I had to space out the tiles to get an idea of placement and figure out which ones I needed to cut. 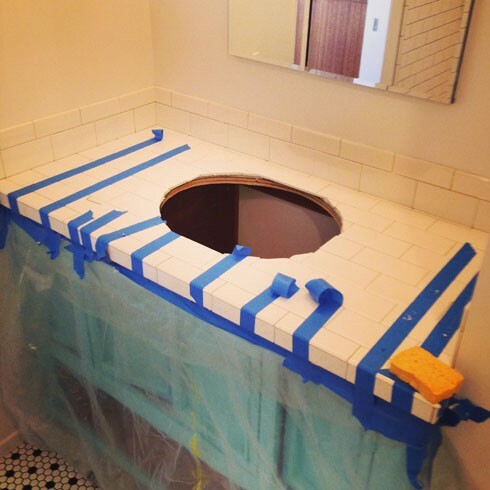 I had no idea that tiling was such an intricate process and that there were so many PIECES involved! Edge tiles, corner tiles, border tiles…the list went on and on! 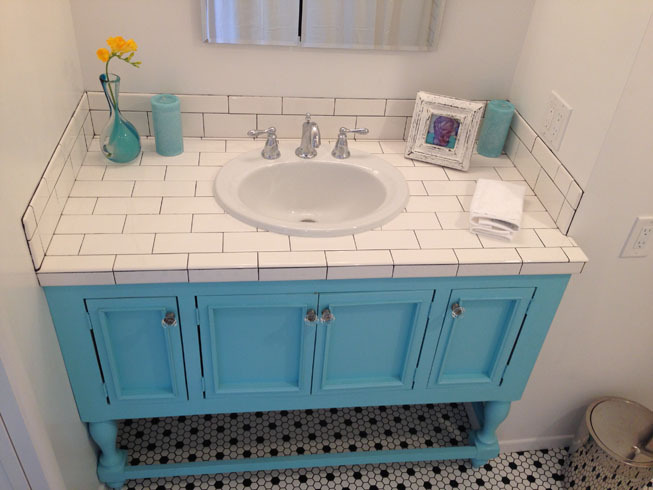 Thankfully we used a simple subway style tile for our vanity so our local hardware stores always had what I needed. 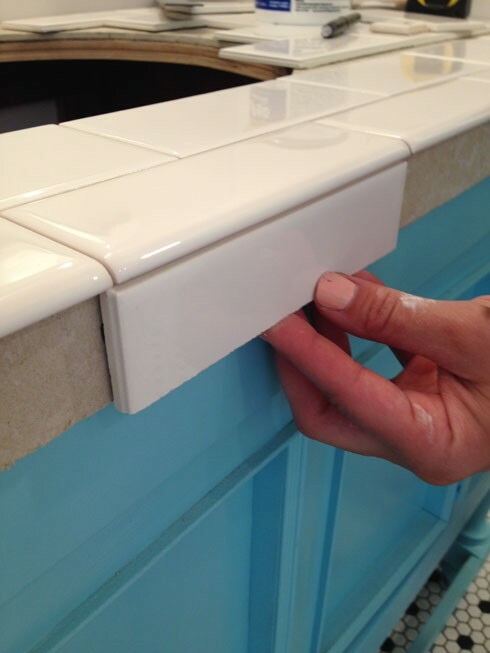 After adhering the tiles to the surface and edge of the vanity, they need to be taped so that gravity doesn’t pull them down and the edge pieces fall off. 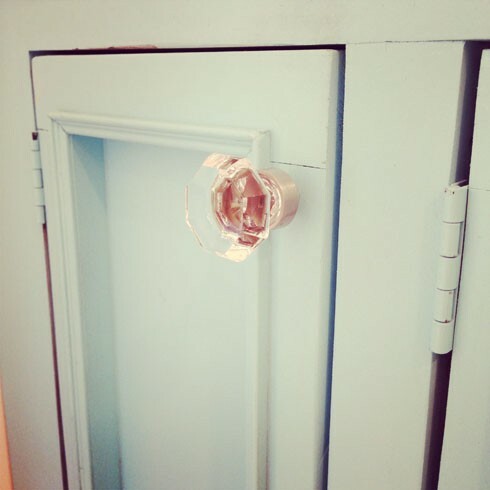 It took a while to find the perfect knobs and hinge hardware for these cabinet doors, but we eventually found some pretty crystal knobs that elevated the Tiffany blue color of the vanity (which was spray painted for a smoother finish). Tiling is complete here and the sink was installed by the reno crew. 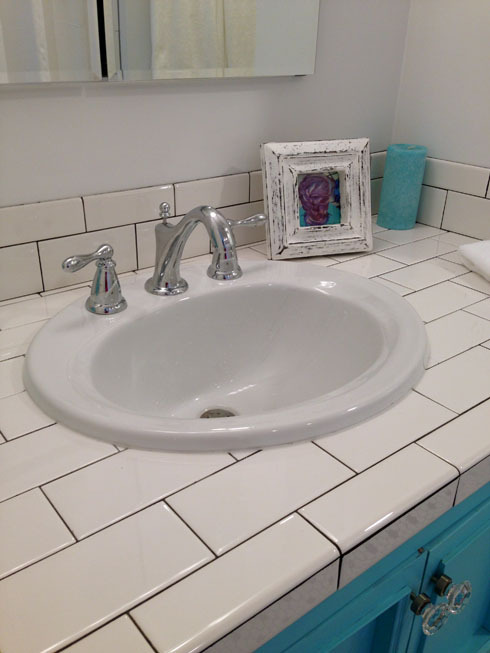 The sink was purchased at the Habitat Rehab store for only $20, and it was like brand new!